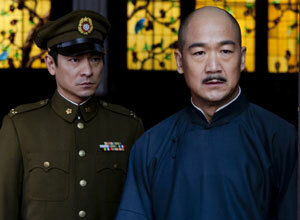 (left) Tang Guoqiang as Mao Zedong, and (right) Andy Lau with Zhang Guoli as Chaing Kai-Shek. The Skinny: A resounding success as a parade of who’s who in Chinese cinema, the People’s Republic of China’s 60th anniversary celebratory film Founding of a Republic is nevertheless not much a film due to its overreliance on lengthy, dialogue-based exposition. History buffs will be happy, but those who want to learn something may get lost in the film’s broad canvas. Kevin Ma: First off, a disclaimer: I will only review The Founding of a Republic from a cinema point of view. I will not criticize its ideological slant since it’s something to be expected. Theoretically, it should not affect how I view the film as a work of “art”. Anyway, most people who read this review are likely not watching Founding of a Republic for its pro-Communist message. Instead, the main attraction is how directors Han Sanping and Huang Jianxin manage to fit reportedly 170+ stars and directors into a 139-minute historical epic. Founding of a Republic is the cinematic equivalent of an awards ceremony, turning an exposition-filled propaganda film with no commercial value into a celebratory party filled with a who’s who of Chinese cinema. The result is a record-breaking hit – it’s now the highest-grossing Chinese-language film in China – that will go down in history for having the best marketing strategy ever for a Chinese film. However, what the producers don’t tell you is that stars like Andy Lau, Jet Li, and Zhang Ziyi appear in only cameo roles, with few of them having bearing on the actual plot (Tony Leung Ka-Fai’s brief, dialogue-less appearance for a lame joke ranks as the most gratuitous). In fact, big names like John Woo couldn’t even fit in the final cut. I’m sure China appreciates their sacrifice, especially since all the actors reportedly worked for free to keep the film’s budget down to a reported RMB$30 million, the same reported budget as Wong Jing’s On Her Majesty’s Secret Service. The main stars here are Tang Guoqiang as Communist Party leader Mao Zedong and veteran actor Zhang Guoli as Kuomintang leader Chiang Kai-Shek. Their story begins in 1945, just after World War II, with the two party leaders meeting in Chongqing to negotiate some kind of peaceful co-existence. The scene also offers an opportunity for Jet Li to pop up as a military officer who declares his refusal to fight a civil war. What that means is that Li won't be appearing in the rest of the film, as history tells us that peace didn't last. Disagreements over the restoration of China and the KMT’s goal of a one-party government break the peace, and the conflict quickly descends into war, as the Communist party fights honorably and gloriously to overcome the powerful KMT army. Meanwhile, the KMT tries to contain its internal chaos. It would be impossible to give a more detailed summary of the film’s plot, since every scene features so much exposition that any plot description would become a history book. Instead of focusing on a specific period of history, the filmmakers cram in as much as possible with a parade of endless meeting scenes featuring their historical characters. After a meeting to discuss something about to happen, the filmmakers follow it with another meeting discussing what has apparently already happened. Everything that happens is mentioned rather than shown, and most of the scenes portraying the actual war appear to be stock footage from other propaganda films (Tang Guoqiang, after all, has played Mao at least ten other times). So perhaps the modest budget is not such a surprise, after all. As a result of the rampant exposition, those who don’t know the history between the two parties (except for the obvious ending) will be frustrated at the film’s lack of effort to engage newcomers. With constant onscreen text indentifying every new character, it’s useless to remember what significance minor characters like Chen Kaige’s General Feng, Feng Xiaogang’s gangster boss, or Leon Lai’s advisor character have in the big picture. Ultimately, it’s not hard to get lost in the not-so-intriguing political negotiations the film presents. Those looking for a “People’s Republic of China for Dummies” primer in Founding of a Republic will be both frustrated and disappointed. On the other hand, those who have an interest in history and know exactly what’s going on may somehow remain entertained. Even though there's little surprise in the focus on the glorious victory achieved by the Communist Party, the initiated may still be surprised by the sympathetic portrayal of the KMT. Chiang Kai-Shek and his son Chiang Ching-Kuo (played well by Aloys Chen Kun) are humanized characters here, trapped between their responsibilities towards their country and pleasing members of the KMT. The film suggests that the KMT lost because of forces within their party, and not because of the power of the Communists - an unexpected move for a pro-Communist propaganda film. The portrayal of the KMT is easily the most interesting part of the film, and would’ve made for an intriguing character study. Some steps are also taken to humanize Mao; the film shows him passed out drunk while his comrades celebrate, and one sequence of a barely-awake Mao being carried out in pajamas during an air bombing reportedly almost got the film banned. 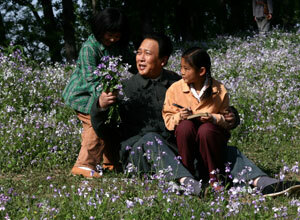 However, obvious ideological agendas prevent the filmmakers from lending the Communist characters any shades of gray. Notes:  Vivian Wu plays Chaing Kai-Shek's wife Soong May-Ling, the same historical figure that she played in Mabel Cheung's 1997 historical epic The Soong Sisters.  Kozo's mini-review of The Founding of a Republic can be found here.